​is used to treat epilepsy, ulcers in the stomach and intestines, headaches and heart problems. It is also used for high blood pressure, kidney stones and bacterial, viral, parasitic and fungal infections. 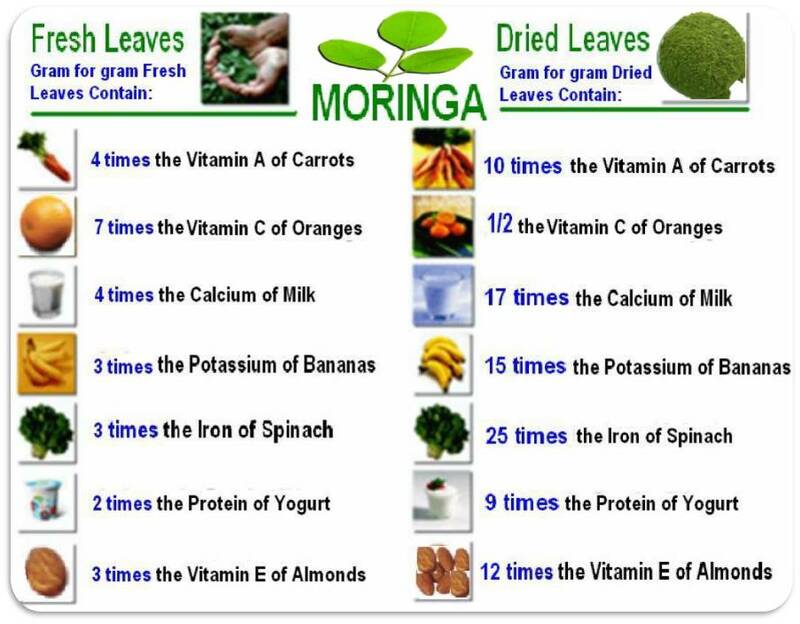 Moringa can reduce fluid retention, treat thyroid disorders, reduce swelling and increase breast milk production. Some people take moringa to boost the immune system. Moringa contains minerals, vitamins and proteins, and it can be used as an antioxidant to prevent harm to cells. Moringa is sometimes used as an astringent to dry the skin. People may apply it directly to the skin to treat abscesses, warts, wounds and snake bites, notes WebMD. It may also help to treat athlete's foot, dandruff and gingivitis. Moringa seeds are sometimes used to make oil, which is used in hair products, foods and perfume. After extracting the oil, the seed cake can be used to purify water and as a fertilizer. Moringa is grown cheaply and easily, and it remains nutritious when dried. For this reason, in addition to being drought-resistant and very fast-growing, has a multitude of uses. This booklet focuses just on ways of using the tree to improve health. But taking all its potentials into account, it is very appropriate to call Moringa "the miracle tree." Moringaceae. Moringa stenopetala is native to Ethiopia and northern Kenya. M. peregrina is found in the Sudan, Egypt, the Arabian peninsula and as far north as the Dead Sea. M. ovalifoliagrows in Angola and Namibia. However, the best known member of the genus is Moringa oleifera, a fast-growing, drought-resistant tree native to sub-Himalayan tracts of northern India but now distributed world-wide in the tropics and sub-tropics. ​​Moringa was well known to the ancient world, but only recently has it been "rediscovered" as a multi-purpose tree with a tremendous variety of potential uses. The pleasant-tasting edible oil which can be extracted from the seeds was highly valued by the ancient Roman, Greek and Egyptian civilizations for use in making perfume and in protecting skin, and during the 19th centuryMoringa oleifera plantations in the West Indies were exporting the oil (known as Ben oil) to Europe for use in making perfumes and as a lubricant for fine machinery. In the Indian sub-continent Moringa has long been cultivated for its edible fruit: today these are exported, fresh and in tins, to consumers in Asia and Europe. The edible leaves of the tree are very nutritious and are consumed throughout West Africa as well as in some parts of Asia. Powder from seed kernels works as a natural coagulant which can clarify even very turbid water, removing up to 99% of the bacteria in the process. ​Tannin: The bark and gum can be used in tanning hides. ​Moringa was well known to the ancient world, but only recently has it been "rediscovered" as a multi-purpose tree with a tremendous variety of potential uses. The pleasant-tasting edible oil which can be extracted from the seeds was highly valued by the ancient Roman, Greek and Egyptian civilizations for use in making perfume and in protecting skin, and during the 19th century Moringa oleifera plantations in the West Indies were exporting the oil (known as Ben oil) to Europe for use in making perfumes and as a lubricant for fine machinery. ​In the Indian sub-continent Moringa has long been cultivated for its edible fruit: today these are exported, fresh and in tins, to consumers in Asia and Europe. The edible leaves of the tree are very nutritious and are consumed throughout West Africa as well as in some parts of Asia. Powder from seed kernels works as a natural coagulant which can clarify even very turbid water, removing up to 99% of the bacteria in the process. "Then Moses led the people of Israel on from the Red Sea, and they moved out into the wilderness of Shur and were there three days without water. Arriving at Marah, they couldn't drink the water because it was bitter (that is why the place was called Marah, meaning "bitter"). Then the people turned against Moses. "Must we die of thirst?" they demanded. Moses pleaded with the Lord to help them, and the Lord showed them a tree to throw into the water, and the water became sweet." ​The powder from crushed Moringa seed kernels works as a natural flocculant, binding to the solids in water and causing them to sink to the bottom. Since bacteria in water is generally attached to solid particles, treatment with Moringa powder can leave water clear with 90-99% of the bacteria removed. (Additional treatment of the water by boiling or adding chlorine or bleach is needed to render it completely safe to drink). Seed powder from Moringa stenopetalais used by women in the Sudan to clarify the turbid water of the Nile. To treat 20 liters of water: Remove the shells from mature Moringa seeds and crush the white kernels in a mortar until a fine powder is obtained. Do not use discolored seeds. Add 2 grams (2 teaspoons) of powder to a cup of clean water and shake for five minutes in order to activate the chemicals in the powder. (This can be done by putting the powder and cup of water into a bottle and then shaking the bottle for 5 minutes). Filter this solution through a clean cloth into the bucket of water to be treated. Stir the bucket rapidly for 2 minutes, then slowly for 10-15 minutes. Leave the bucket to sit without being disturbed. After one hour, the solid particles in the water will have settled. A general rule of thumb is to use the powder from one Moringa kernel per every two liters of water when the water is somewhat turbid, and one kernel per liter when the water is very turbid. Moringa seeds and seed powder can be stored, but the paste must be made fresh each time water is to be purified. Seed cake from which oil has been extracted retains its coagulant properties. It can be dried and stored and the powder used to clarify water as needed. Modern uses for the herb focus largely on cardiovascular health. The herb is also a rich source of phytochemicals with antibacterial properties that promote digestive tract health. Other compounds isolated from the herb appear to have inflammation-modulating and immune system-boosting activities. Its anti-fungal properties have been used to help maintain healthy skin. Further investigations suggest that the legendary drumstick tree holds promise in other areas of health; it has been researched in the areas of liver wellness, respiratory health, joint health, thyroid performance and water balance.